The Whitbread Award–winning author delivers an outstanding biography of Queen Elizabeth (1533-1603). This page-turning book is history, biography, scholarship personified, and a crystal-clear look at Elizabeth in the war years that erases the myths and presents the real woman. Historian Guy (Henry VIII: The Quest for Fame, 2014, etc. ), who is exceedingly well-versed in Tudor studies, deconstructs original sources, chooses which of many are more likely to be true, and shows Elizabeth as a vain, paranoid queen who endorsed torture and fought for her rights and privileges. Well-read, intelligent, fluent in French and Italian, Elizabeth believed she was beloved, but all her subjects could see were unproductive harvests and widespread poverty and disease. Among other primary sources, William Camden’s Annales, completed in Latin in 1617, is Guy’s best target. The author takes apart Camden’s statements as deeply biased and the English translation as pure bowdlerization. In 1584, the assassination of Prince William of Orange began the wars with Spain that would last the rest of Elizabeth’s life. The defeat of the first Spanish Armada in 1588 was only a short reprieve from the constant depletion of her treasury, as she also supported Henry IV of France against Spain and the Catholic League. Manipulated—and at the same time, likely saved—by Chief Minister Burghley and her spymaster, Francis Walsingham, she struggled to assert herself. It was Burghley’s contrivance of Mary, Queen of Scots’ death that brought Elizabeth to what the author calls her “Armada of the soul.” Her responsibility for the execution of an anointed queen haunted her for the rest of her life. During her 45-year reign, she learned how to get around those who disagreed with her, but she never succeeded in controlling some of her favorites. Near the end, Guy’s comparisons to Richard II, the usurped king, the usurper Bolingbroke, and Shakespeare’s play take your breath away. 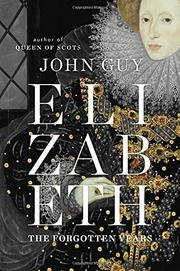 One of the best biographies of Elizabeth ever.